Personalized newspapers have been the dream of media mavens for a couple of decades now. Obviously, the Internet makes it possible for anyone to get the news they want, when they want it, no matter how broad or narrow her or her interests might be. MeeHive by Kosmix is a news aggregator that’s similar to Google and Yahoo, but a quite a bit more refined. 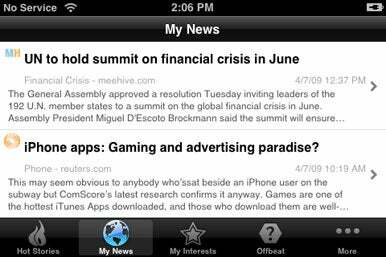 Although MeeHive for the iPhone and the iPod touch can’t quite match the graphic appeal or navigational ease of MeeHive’s Web site, it does provide a convenient one-stop location for all the news your handheld’s bandwidth can fit. Alas, while MeeHive lets you indulge your interests, the app gives you few tools to manage the buzz of information. You Decide, They Report: MeeHive promises to deliver personalized news to your iPhone or iPod touch based on your interests. The one drawback of the whole “Daily Me” approach to news is that it gives readers what they want without necessarily giving them what they need. To borrow an old Rumsfeldism, you don’t always know what you don’t know. MeeHive tries to overcome that deficiency when you launch the app by displaying a few dozen of the day’s “Hot Stories.” So you may not care about the anti-government rioting in Thailand, or American Idol’s deliberations over the two- or four-judge format, but the stories are there for you to browse or ignore. If you want to read a story, simply tap on it and the piece will open in a browser within the app. I found constantly zooming in and out of the text a bit of a chore, but MeeHive does support the landscape view. Another glitch I discovered was the app’s navigation bar cuts off the summary of the “Hot Stories” at the bottom of the screen, and you cannot scroll. It’s easy to skip MeeHive’s top stories, though; just tap My News or My Interests at the bottom of the screen. You can also configure the app’s lower menu bar to include the subjects of your choice—at least in theory. I found the configuration edit page to be somewhat frustrating and counterintuitive. Although it appears as if you can move section icons around with a drag of your finger, that doesn’t seem to do the job. To be honest, I never figured out how to reconfigure MeeHive’s home screen. You can add as many or as few subjects as you like through MeeHive.com, as well as through the app. But your interests may not actually coincide with the news of the day. Unlike most RSS readers, MeeHive will not show you when you have new stories under the various interests—or keywords—you have selected. Obviously, the more general your interests, the more likely you will have stories to read. I was disappointed to find so many of my subject interests bereft of news. Other users’ mileage will vary, but I do wish the developers would add a feature to flag topics when new stories appear. Similarly, there is currently no way for a reader to sort topics by level of interest, or any other way. Right now, your interests will display alphabetically. If you happen to be a news junkie like me, then scrolling through so many topics can induce serious thumb-cramping. Another drawback: A few RSS readers and news apps—notably the New York Times iPhone app ( )—allow offline reading after downloading content. MeeHive will not work without a 3G, EDGE or Wi-Fi connection. The developer tells me that there are plans to permit offline reading in a future release, but would offer no timeline for when that feature would appear. In general, I like the way MeeHive lets readers tailor information to their personal tastes. But for a service so focused on the reader’s interests, it’s a bit disappointing to use an app lacking much in the way of customizable features. I hope that Kosmix makes the reading experience easier with future updates. MeeHive is compatible with any iPhone or iPod touch running the iPhone 2.x software update.